Finally checked out from the Santa’s grotto of the Novotel at Brighton Le Sands. Great hotel, but there are only so many breakfasts you can take listening to the Jingle Bells Rocks and Rudolph the Red Nose Reindeer. I’ve started using my ‘end youth homelessness’ Keepcup, as the next hotel down at the Rocks has cups so small you can hardly fit a teabag in them. Love the quote on the Keepcup instructions – ‘through our own actions we inspire others to be the change they wish to see in the world’. I’m advocating for a world of big cups. 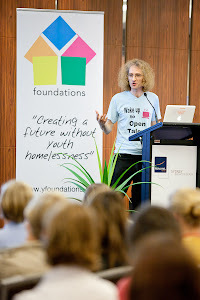 Today I was a guest ‘expert’ at the NSW Homelessness Unit ‘Youth Housing Roundtable’. This kicked off with a presentation on a ‘research synthesis’ on youth housing models, which, although very useful, had seemed to miss out a few important points on the Foyer experience: namely, the evidence showing that Foyers do operate with young people with ‘complex needs’ as it is called; and the importance of our quality assurance experience to define Foyerness around a focus, approach and relationship rather than a fixed model. It was good to be able to throw that into the conversation, straight from the horse’s mouth. I used my own 30 minute slot to pick up Minister Mark Arbib’s quote from EYHC that housing provision should enable young people to ‘reach for their dreams’. In other words, how do we put the focus on ‘dreams’ back into housing – which very much lies at the heart of the Open Talent vision. Reflecting on our current work with Investor Partners in the UK, and our ‘youth offer’ paper for the UK Government’s Youth Action Group, there seemed plenty of connections to support the Australian experience, as well as perhaps the ‘permission’ to be ‘lateral’ in thinking. After lunch, we broke into small groups to design ideas for a capital project. My group came up with a ‘flexi youth space’ proposal, which we focused on flexible design options to shape around different uses for different client groups, while building into the design the potential for social enterprise. It was good fun, although I kept wondering why there were no young people in the room, and why there didn’t seem to be a more formal and collaborative process to take forwards the thinking. But I’m just the voice of a political tourist. I left with the feeling that there is an opportunity to work with organisations in Australia on an alternative approach to outcomes and research evidence that can promote the types of innovative provision that I think anyone who understands the youth sector believes in. If we can’t tell the real story, in everything we measure and say, then we have lost the right to be ‘experts’. Wouldn’t it be great, from an Open Talent perspective, to create our own design agency with young people as the co-consultants. It’s not just a question of the collaborative involvement process; it’s also an opportunity to turn someone’s experience into a business solution. It was sad to say goodbye to so many wonderful, passionate people. As the Keepcup suggests, we leave each other with the inspiration for change. I hope I’ve given as much as I’ve taken from Sydney.